Lush greenery is set in a spectacle of Irish charm. 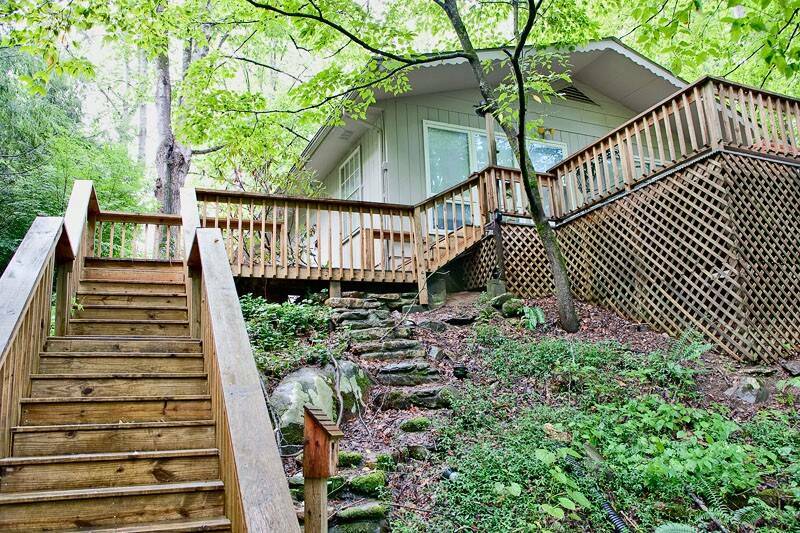 Just a short drive from downtown Gatlinburg, this 2 bedroom and 2 bath, mountain cottage located in a beautiful wooded area with a running creek. 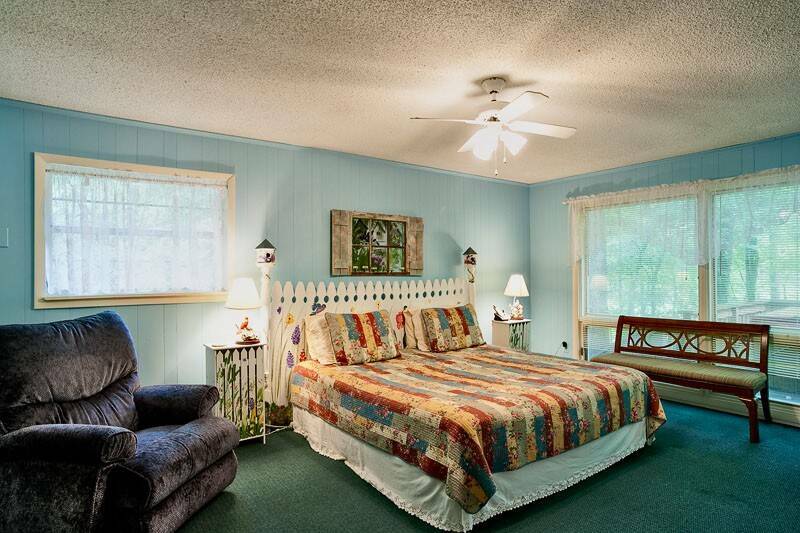 This cozy cottage is filled with all of the accommodations you need. 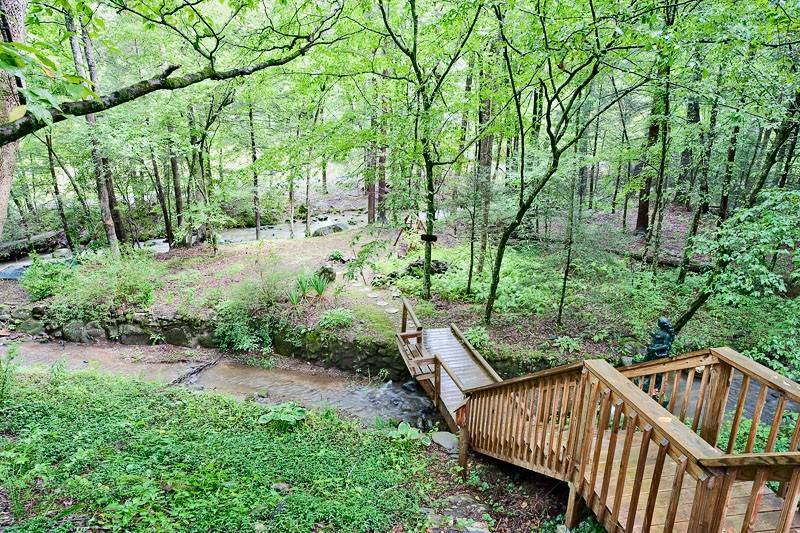 Off of the back deck are steps leading down to its own private bridge and island! 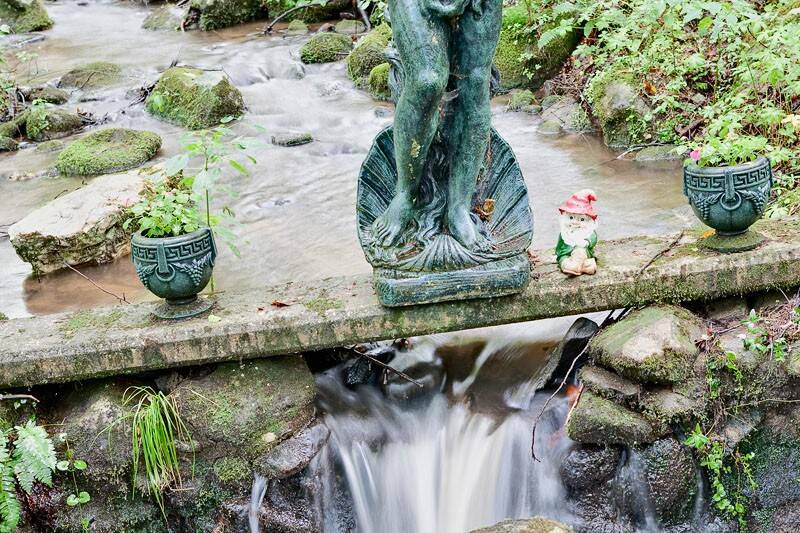 Two flowing creeks rush on either side of the island, creating the perfect place to try and spot a Leprechaun! We loved Leprechaun Island, it was perfect for my husband and, I. Had everything we needed, had nice large rooms, roomy kitchen and living room, but still cozy & comfortable. It's a little older which made it perfect as it's still in very nice condition. 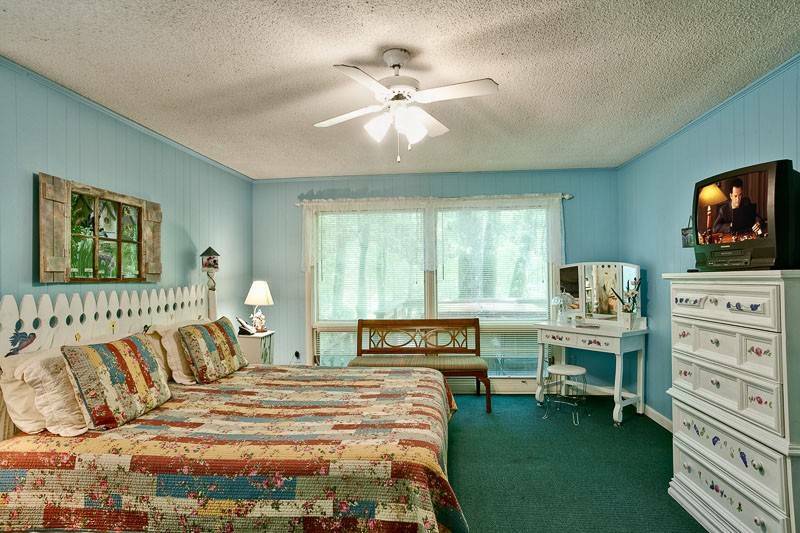 We have stayed in those perfect up to date homes where you're afraid to sit on the furniture, not fun for a vacation. This cottage was a lot of fun, nice back porch to watch the rushing creek and a nice hot tub to use while enjoying the view. The pool table was great for recreation, and appreciated having a washer/dryer to catch up with our laundry. 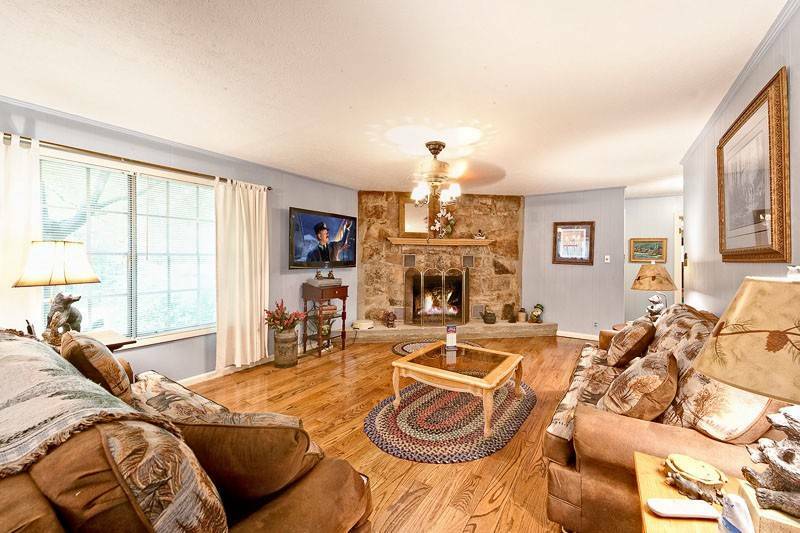 It was convenient to Gatlinburg & Pigeon Forge, and just a few minutes away from a grocery store. 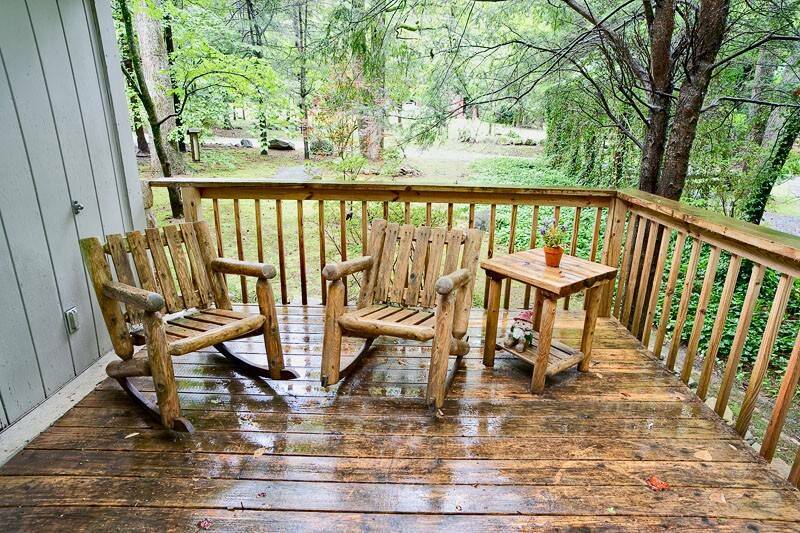 And you could park in front of door to screen porch & kitchen and never have to climb stairs the whole time. Staff were very informative about the property and the area. Home was very clean and pleasant would stay here again. Heartland made the rental procedure easy and provided us with the housing we needed to accommodate six. The streams outside Leprechaun Island were an added treat! Loved the place everything was supplied. If we had a problem we called and it was taken care of.. enjoyed the privacy. We were overjoyed with our accommodations! The view was amazing. Being able to sit on the back deck and watch the creek roll by was beautiful and relaxing. I came in with myself and 5 kids ranging in age from 16 to 4, and everyone loved the cabin. I was worried with bringing so many kids I had chosen a place that may be to cramped, but it was just the opposite. There was so much space, it felt roomy and very comfortable. We will be coming back! Everything was AWESOME. Just needs more lights on screened in porch. Great, amazing, will definitely be back. Great place to stay. I would recommend this place to anyone. We will definitely be back. My wife loved that it was already decorated for Christmas. We loved the place !!!! It was very nice and we enjoyed it !!!! We loved the place and we had a good time !!! It was a perfect stay. Our family really enjoyed our stay and Leprechaun Island was perfect for us. Beautiful scenery and had everything we needed. The Heartland Rentals Office was very helpful and addressed anything we needed very quickly. We really didn't need anything we just wanted to add another night and they were very prompt in getting us reserved another night and very easy to work with us. We will be back! Latches for screen doors on porch would be nice addition. We liked the coverings on all the windows which created privacy. This is our 3rd time staying at Leprechaun Island and we love it. We did have issues this year with electrical outlets, neither outlets in the bathrooms were working. But overall, we had a great stay and plan to stay again in the future. Blessed to spend our family vacation at Leprechaun Island! Our family had a wonderful time in this spacious, clean, and inviting cottage. 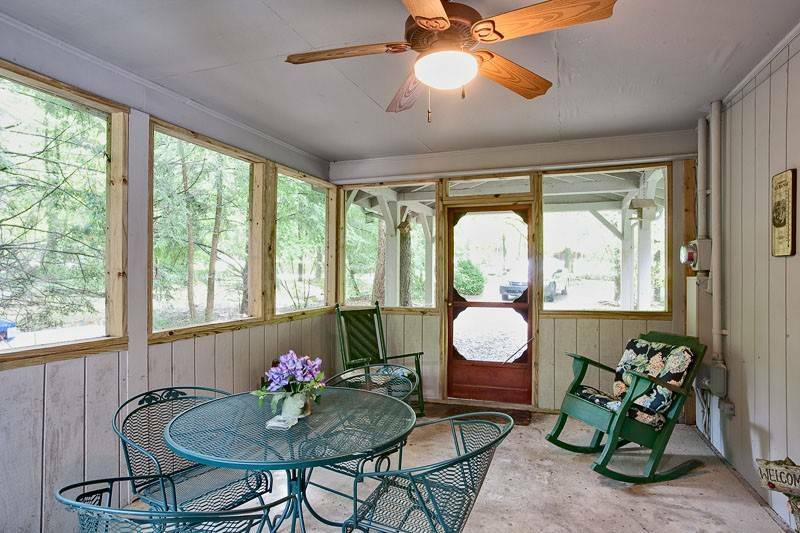 The screened-in porch area was a favorite spot for breakfast most mornings and the dining room table sat everyone comfortably for an evening meal. We enjoyed the hot tub and pool table nightly after being out and about all day. The backyard was so fun and the entire cottage was charming inside and out. We hope to stay again in the future! It felt like home, very roomy. Loved the outside set up. Just what me and my family needed, a quiet little get-away. Very homey. Will visit again. Beautiful view, very quiet place. Nice hot tub. First time in the smokie and thoroughly enjoyed our stay. Cabin was warm and friendly and loved having water near the property. Enjoyed the quiet nights in the swing and the hot tub. Would come back again and visit Leprechaun Island. We enjoyed our stay here. 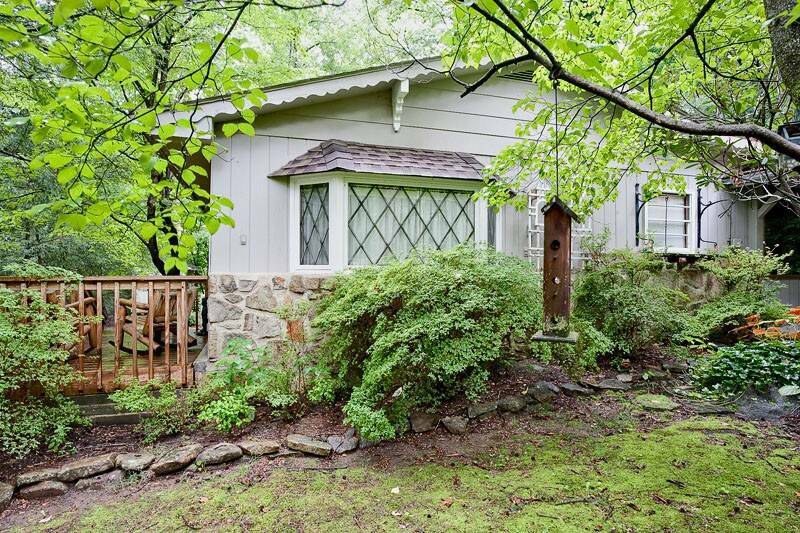 The back yard is beautiful and the cabin is comfortable. We realized as we were getting ready to check out that we had an issue with our vehicle, and the staff was great, letting us stay a little longer to wait comfortably inside for the AAA service to arrive without extra charges. It was a quiet, clean out of the way place to stay. My only complaint with the cabin was the beds were very uncomfortable. A wonderful cabin that the entire family enjoyed! We have stayed the past 2 summers at leprechaun island. The whole family loves the cabin, both inside and out! 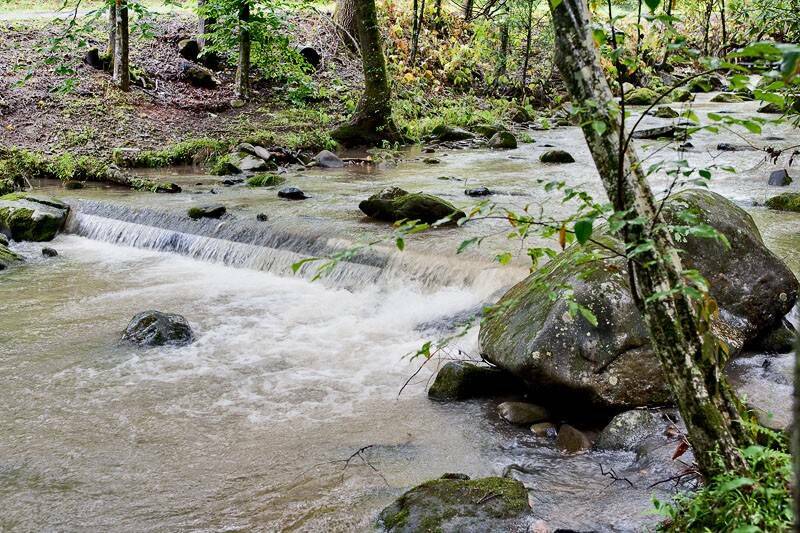 The stream behind the cabin is a refreshing and relaxing place to sit after a long day of hiking. Excellent cabin for the price. A very enjoyable experience, would most definitely do it again. Beautiful Cottage. Made my stay in Gatlinburg extremely enjoyable. Love the atmosphere. It was peaceful and relaxing!!! Loved everything about Leprechaun Island. It was very peaceful,relaxing, and beautiful. Kids loved playing in the creek. Loved the setting of this quaint cottage. It was so peaceful and quiet and really enjoyed the stream behind the cottage. The only thing I would suggest is perhaps replacing some of the cookware. But we loved the cottage, the setting and the Heartland team are great to work with. No complaints and will definitely use Heartland again! The whole experience with the cabin and staff was amazing!!!!! Will definitely stay with you again!!!! We loved your cabin!!!!!!! Spend a few days here with another couple. 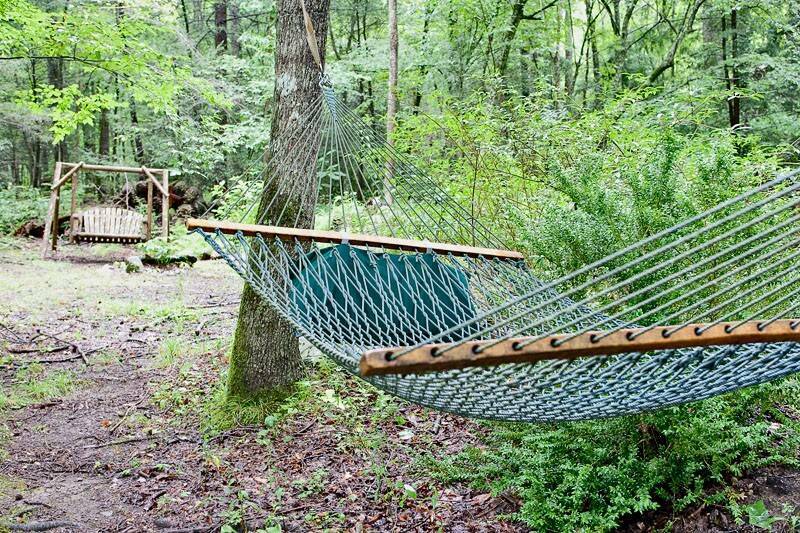 The house and property are very wooded and relaxing. The stream on the property can be heard through the open windows and was nice to hang out near. The hot tub was decent (seen better days) but worked well and fit four of us. There are plenty of books, movies and games to keep you entertained. T.V. 's in all rooms with cable. The house is a bit dated, but clean and comfortable. 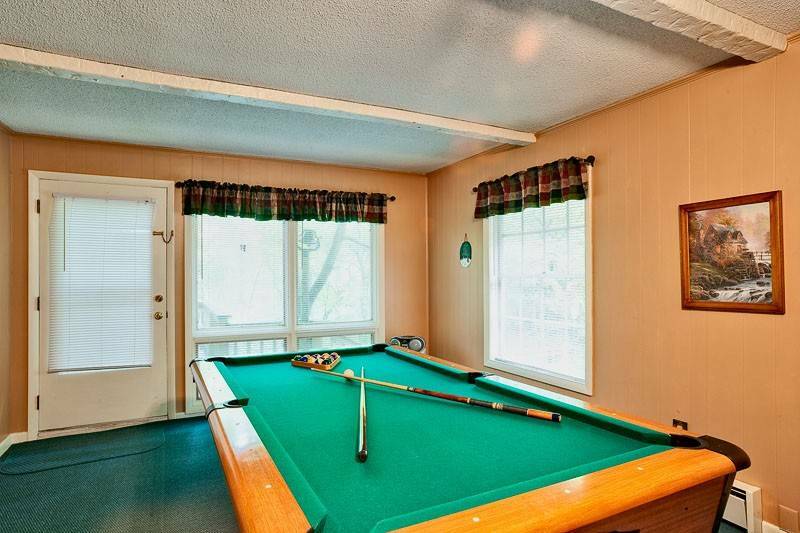 As mentioned in the guest book, the pool table was in pretty bad shape. 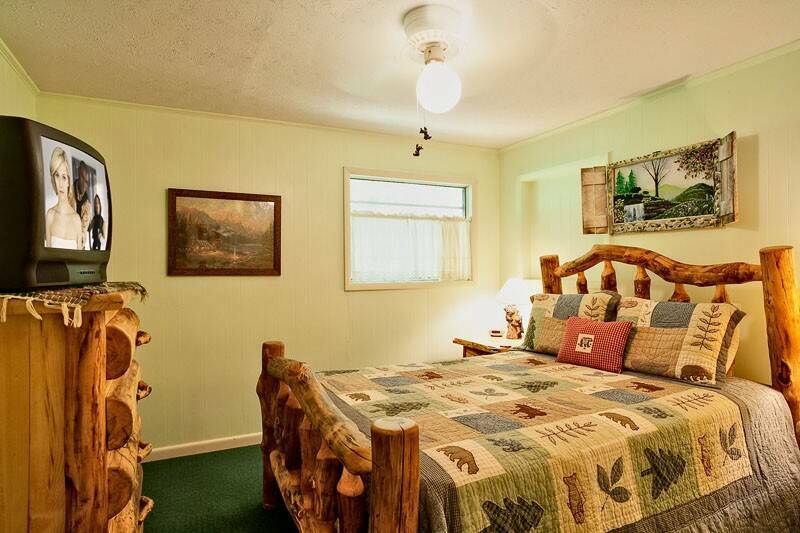 It's about what you would expect for a rental cabin. It was great for trick shots, as all the balls rolled to one side. ;-). We were't inside enough to worry too much about shooting pool. 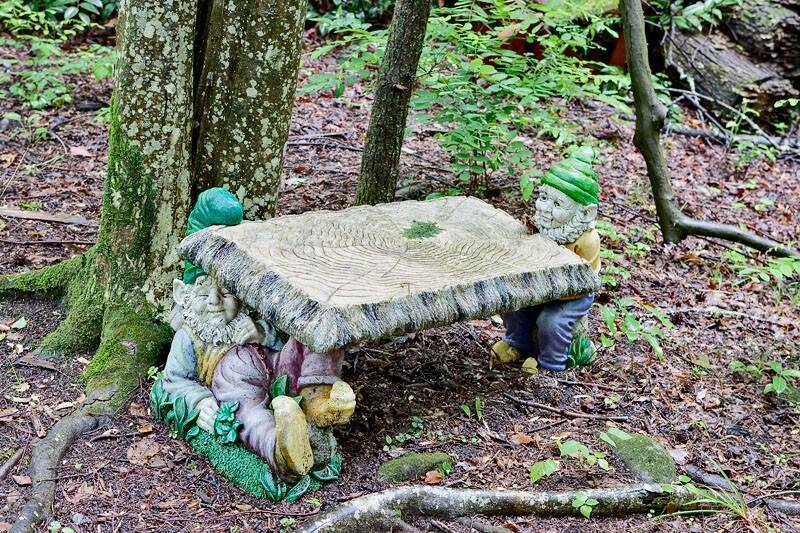 As we would walk to property, we tried to find all the Gnomes that were spread about. It is a bit off the beaten path, but back and side roads can get you anywhere in Gatlinburg in about 20 minutes. There is also a Food City within 5 minutes or so. Loved this cabin...it was very clean..I would recommend this cabin to anybody that has kids and even to those that don't. 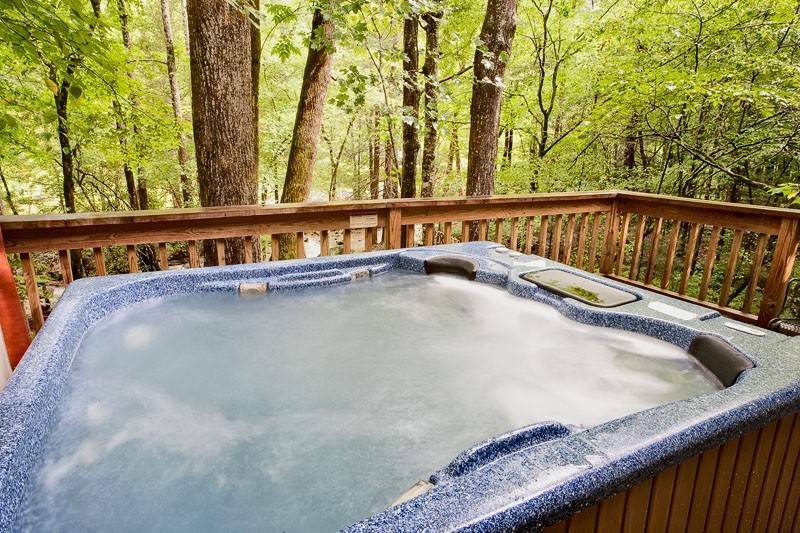 My children loved playing in the creek, the Jacuzzi and they loved playing pool.....Rent this cabin you will not be sorry. Loved the creek. The fireplace was great. I did not expect the Christmas decorations and they were such a joy. It felt like home. It felt like I was in a Godly home. We had everything we needed. The only thing needed to be done was some dusting of fans & in entertainment room. I would definitely stay again. Thanks to the owners for opening their home. This cabin was just as advertised and was quite comfortable plus the forest/creek area and decks made for a wonderful "rustic nature" experience. There was so much room that we wished we had brought friends or family with us. The Heartland staff were exceptional in making sure we had all the cabin details we needed, getting our keys to us, staying in touch to make sure we were satisfied & happy. I loved that they called us on our cell phone when they knew that we were on our way to the cabin. Renee told me to please call her and let her know we got in ok. That...is service! 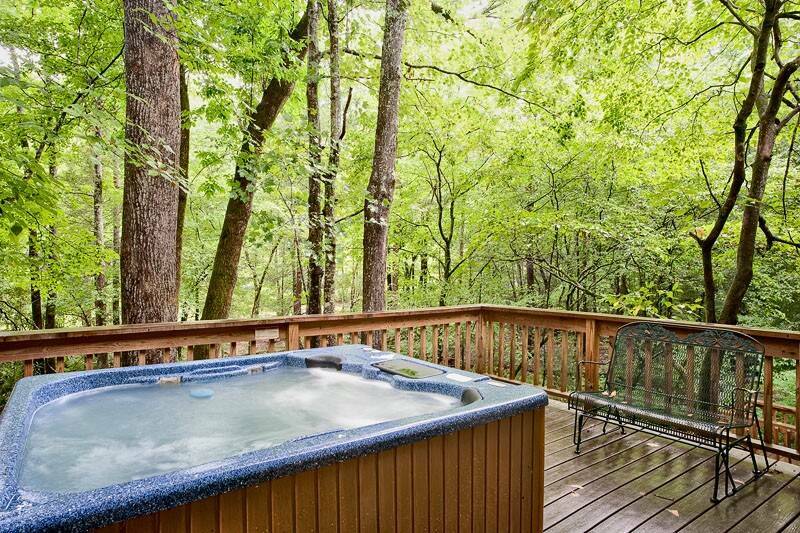 cottage charming and hot tub under stars amazing! enjoyed our stay. hot tub and pool table awesome. The place was comfortable all the way around. I slept better than I do in my own bed. The island was to die for. It is a bit older than other homes I've rented with a few minor glitches easily fixed, but I would pick it over many newer ones. The A/C worked great, unlike some that have a lock to keep the temperature too high. The place has awesome character inside and out. 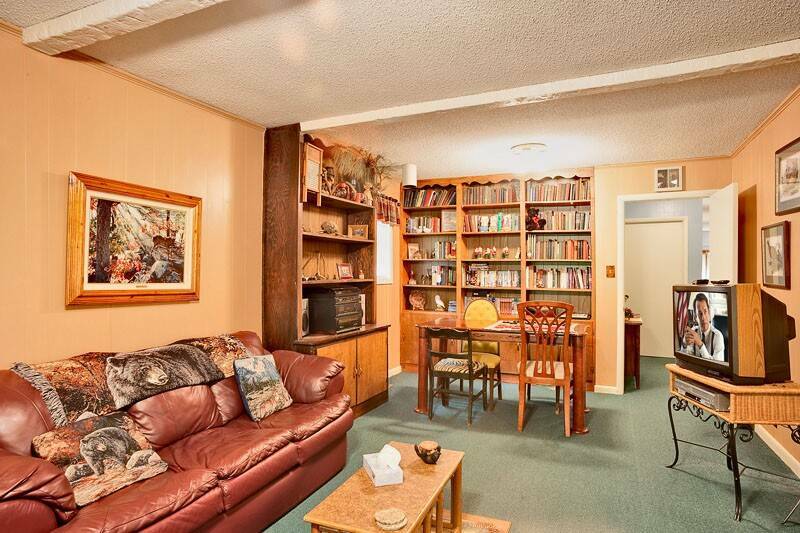 The extra living room in the game room/reading room is a plus. The Gateway to Fun Pass really paid off as well, offsetting nearly 200 dollars in cost right off the top. It would have been more had we gotten to stay more than 2 nights. It's about 10 minutes outside of Gatlinburg, but a great area. We did Legacy Mtn. Ziplining (AWESOME), the Lumberjack Feud Dinner and Show and the Country Tonite Music Show and had a great time. Next time, I want to stay a week!!! Amazing Cabin with the most relaxing back yard on the planet. This cabin was wonderful. The grounds was amazing. We really enjoyed our stay. The home is roomy and cute. It is not new and not for those who expect "high class" accommodations. 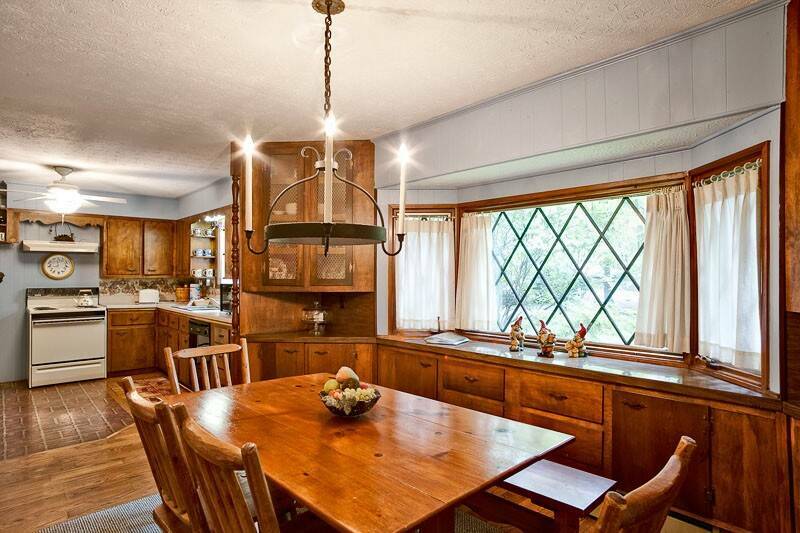 It is an older home with a lot of down home touches. We enjoyed browsing the owner's record (yes they have vinyl) collection, their books, and finding the gnomes. The hot tub and deck were great. The hammock and river fantastic. We played pool every night. No problems with the internet. The complimentary tickets were a huge bonus. My husband LOVED zip lining. The aquarium is great. The staff was friendly and helpful. It was clean and the decor was charming. We also enjoyed the fireplace. Would we buy it if it were for sale and we wanted to move? Absolutely. We will rent from Heartland again.